Life Sciences Division, AU-KBC Research Centre, Anna University, Chennai, India. 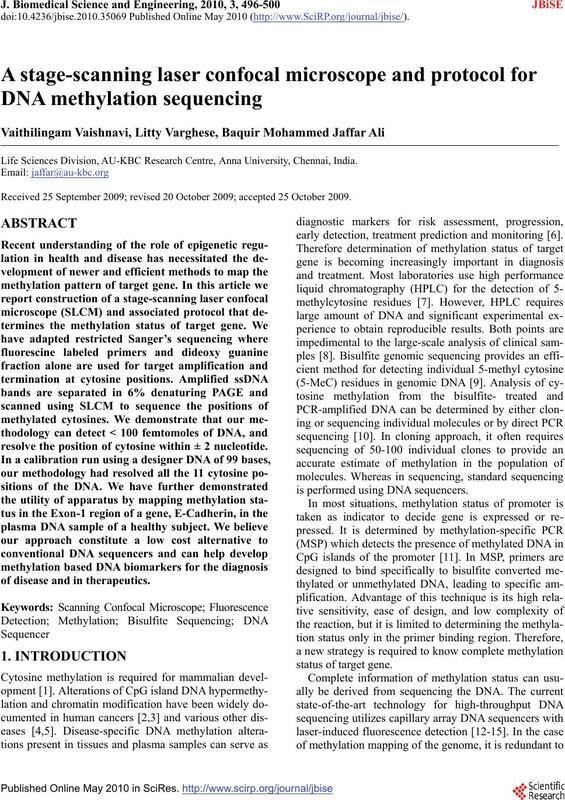 Received 25 September 2009; revised 20 October 2009; accepted 25 October 2009.
resolve the position of cytosine within ± 2 nucleotide. of disease and in therapeutics. early detection, treatment prediction and monitoring . 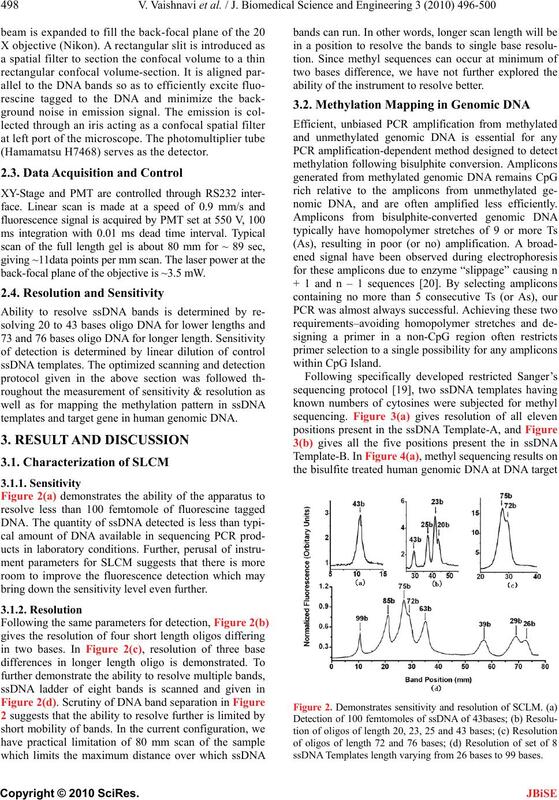 is performed using DNA sequencers. followed by NaOH treatment and ethanol precipitation. Finally it is resuspended in 20 µl of water. 42℃ for 30 sec and 72℃ for 60 sec. tected and resolved by the apparatus. section; SW: Sample well; AG: acrylamide gel. (Hamamatsu H7468) serves as the detector. back-focal plane of the objective is ~3.5 mW. templates and target gene in human genomic DNA. bring down the sensitivity level even further. ability of the instrument to resolve better. nomic DNA, and are often amplified less efficiently. ssDNA Templates length varying from 26 bases to 99 bases. on Exon-1 using methylation insensitive primer is given. positions within 100 bases are plotted (red diamonds). methylated at the CpG islands in the promoter region. 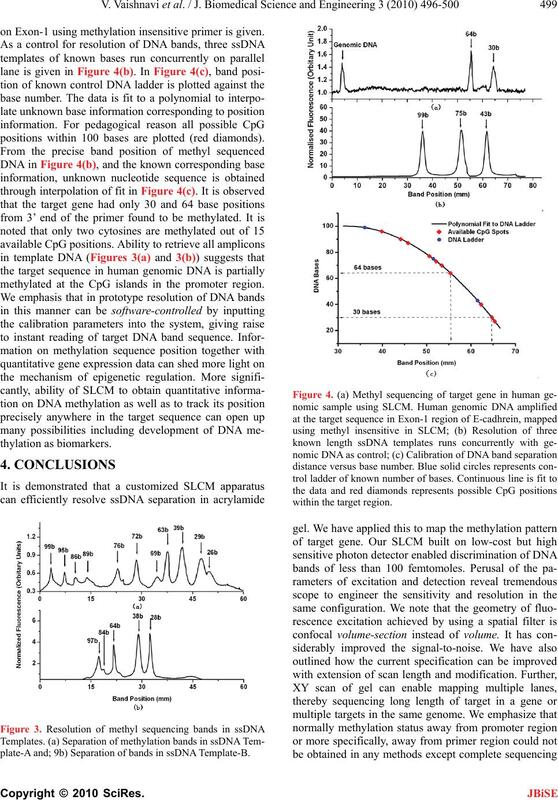 plate-A and; 9b) Separation of bands in ssDNA Template-B. bryonic lethality. Cell, 69(6), 915-926. Clark, S.J., Harrison, J., Paul, C.L. 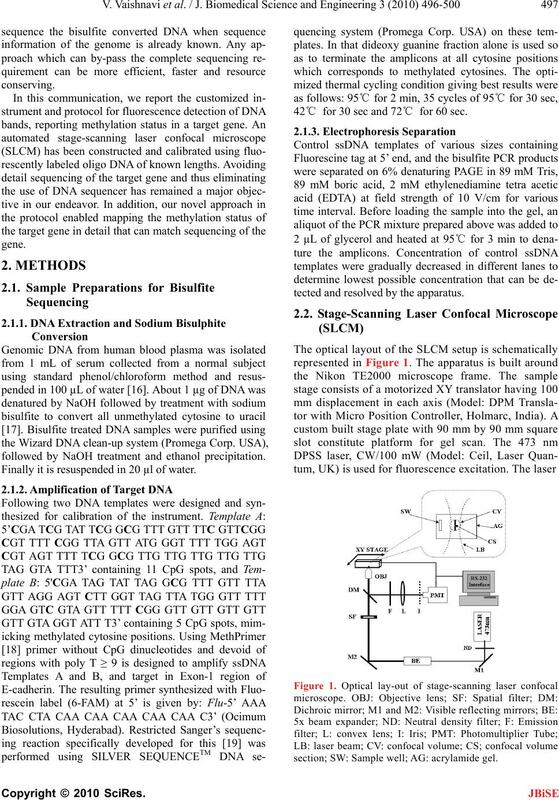 and Frommer, M.
(1994) High sensitivity mapping of methylated cytosines. 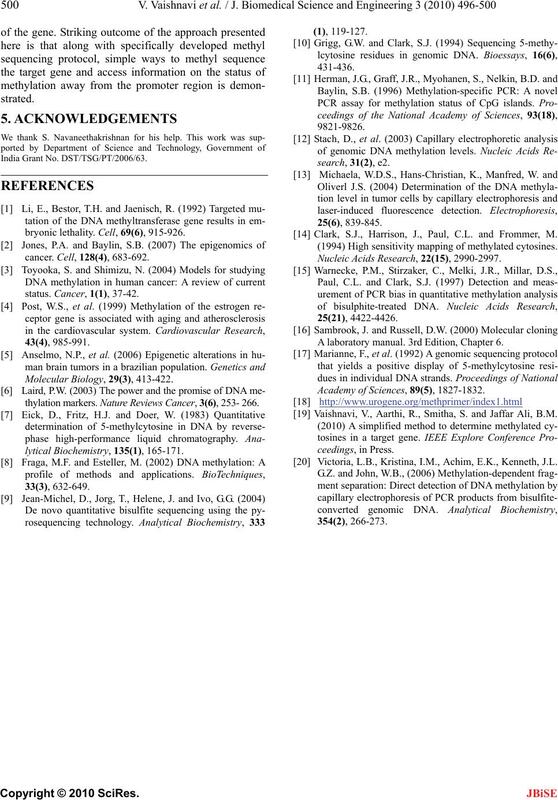 Nucleic Acids Research, 22(15), 2990-2997. A laboratory manual. 3rd Edition, Chapter 6. Academy of Sciences, 89(5), 1827-1832. Vaishnavi, V., Aarthi, R., Smitha, S. and Jaffar Ali, B.M. Victoria, L.B., Kristina, I.M., Achim, E.K., Kenneth, J.L.